For other uses, see Jerusalem (disambiguation). "Al-Quds" and "Bayt al-Maqdis" redirect here. For other uses, see Al-Quds (disambiguation) and Bayt al-Maqdis (disambiguation). During its long history, Jerusalem has been destroyed at least twice, besieged 23 times, captured and recaptured 44 times, and attacked 52 times. The part of Jerusalem called the City of David shows first signs of settlement in the 4th millennium BCE, in the shape of encampments of nomadic shepherds. Jerusalem was named as "Urusalim" on ancient Egyptian tablets, probably meaning "City of Shalem" after a Canaanite deity, during the Canaanite period (14th century BCE). During the Israelite period, significant construction activity in Jerusalem began in the 9th century BCE (Iron Age II), and in the 8th century the city developed into the religious and administrative center of the Kingdom of Judah. In 1538, the city walls were rebuilt for a last time around Jerusalem under Suleiman the Magnificent. Today those walls define the Old City, which has been traditionally divided into four quarters—known since the early 19th century as the Armenian, Christian, Jewish, and Muslim Quarters. The Old City became a World Heritage Site in 1981, and is on the List of World Heritage in Danger. Since 1860 Jerusalem has grown far beyond the Old City's boundaries. In 2015, Jerusalem had a population of some 850,000 residents, comprising approximately 200,000 secular Jewish Israelis, 350,000 Haredi Jews and 300,000 Palestinians. [note 4] In 2011, the population numbered 801,000, of which Jews comprised 497,000 (62%), Muslims 281,000 (35%), Christians 14,000 (around 2%) and 9,000 (1%) were not classified by religion. According to the Bible, King David conquered the city from the Jebusites and established it as the capital of the united kingdom of Israel, and his son, King Solomon, commissioned the building of the First Temple. [note 5] Modern scholars argue that Jews branched out of the Canaanite peoples and culture through the development of a distinct monolatrous — and later monotheistic — religion centered on El/Yahweh, one of the Ancient Canaanite deities. These foundational events, straddling the dawn of the 1st millennium BCE, assumed central symbolic importance for the Jewish people. The sobriquet of holy city (עיר הקודש, transliterated 'ir haqodesh) was probably attached to Jerusalem in post-exilic times. The holiness of Jerusalem in Christianity, conserved in the Septuagint which Christians adopted as their own authority, was reinforced by the New Testament account of Jesus's crucifixion there. In Sunni Islam, Jerusalem is the third-holiest city, after Mecca and Medina. In Islamic tradition, in 610 CE it became the first qibla, the focal point for Muslim prayer (salat), and Muhammad made his Night Journey there ten years later, ascending to heaven where he speaks to God, according to the Quran. As a result, despite having an area of only 0.9 square kilometres (0.35 sq mi), the Old City is home to many sites of seminal religious importance, among them the Temple Mount with its Western Wall, Dome of the Rock and al-Aqsa Mosque, and the Church of the Holy Sepulchre. Outside the Old City stands the Garden Tomb. Today, the status of Jerusalem remains one of the core issues in the Israeli–Palestinian conflict. 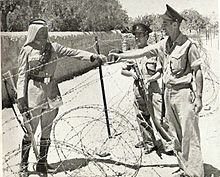 During the 1948 Arab–Israeli War, West Jerusalem was among the areas captured and later annexed by Israel while East Jerusalem, including the Old City, was captured and later annexed by Jordan. 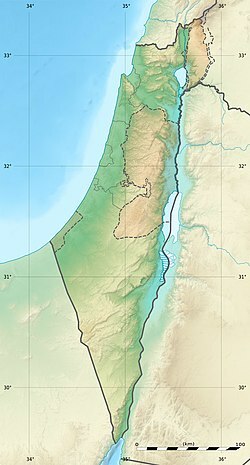 Israel captured East Jerusalem from Jordan during the 1967 Six-Day War and subsequently annexed it into Jerusalem, together with additional surrounding territory. [note 6] One of Israel's Basic Laws, the 1980 Jerusalem Law, refers to Jerusalem as the country's undivided capital. All branches of the Israeli government are located in Jerusalem, including the Knesset (Israel's parliament), the residences of the Prime Minister (Beit Aghion) and President (Beit HaNassi), and the Supreme Court. While the international community rejected the annexation as illegal and treats East Jerusalem as Palestinian territory occupied by Israel, Israel has a stronger claim to sovereignty over West Jerusalem. The name "Jerusalem" is variously etymologized to mean "foundation (Sumerian yeru, 'settlement'/Semitic yry' 'to found, to lay a cornerstone') of the god Shalem"; the god Shalem was thus the original tutelary deity of the Bronze Age city. Shalim or Shalem was the name of the god of dusk in the Canaanite religion, whose name is based on the same root S-L-M from which the Hebrew word for "peace" is derived (Salam or Shalom in modern Arabic and Hebrew). The name thus offered itself to etymologizations such as "The City of Peace", "Abode of Peace", "dwelling of peace" ("founded in safety"), alternately "Vision of Peace" in some Christian authors. The ending -ayim indicates the dual, thus leading to the suggestion that the name Yerushalayim refers to the fact that the city initially sat on two hills. The form Yerushalem or Yerushalayim (Jerusalem) first appears in the Bible, in the Book of Joshua. According to a Midrash, the name is a combination of "Yireh" ("The abiding place", the name given by Abraham to the place where he began to sacrifice his son) and "Shalem" ("Place of Peace", given by high priest Shem), then the two names were united by God. An ancient settlement of Jerusalem, founded as early as the Bronze Age on the hill above the Gihon Spring, was according to the Bible named Jebus (e.g., Judges 19:10:יְב֔וּס הִ֖יא יְרוּשָׁלִָ֑ם: "Jebus, it [is] Jerusalem"). Called the "Fortress of Zion" (metsudat Zion), it was renamed by David as the City of David, and was known by this name in antiquity. Another name, "Zion", initially referred to a distinct part of the city, but later came to signify the city as a whole and to represent the biblical Land of Israel. In Greek and Latin the city's name was transliterated Hierosolyma (Greek: Ἱεροσόλυμα; in Greek hieròs, ἱερός, means holy), although the city was renamed Aelia Capitolina for part of the Roman period of its history. Given the city's central position in both Jewish nationalism (Zionism) and Palestinian nationalism, the selectivity required to summarize some 5,000 years of inhabited history is often influenced by ideological bias or background (see Historiography and nationalism). Israeli/Jewish nationalists (Zionists) claim a right to the city based on Jewish indigeneity to the land, particularly their origins in and descent from the Israelites (see History of the Jews and Judaism in the Land of Israel), for whom Jerusalem is their capital, and their yearning for return. In contrast, Palestinian nationalists claim the right to the city based on modern Palestinians' longstanding presence and descent from many different peoples who have settled or lived in the region over the centuries. Both sides claim the history of the city has been politicized by the other in order to strengthen their relative claims to the city, and that this is borne out by the different focuses the different writers place on the various events and eras in the city's history. 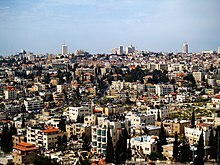 After the Six-Day War in 1967, Shuafat and other places defined as East Jerusalem were incorporated into the Jerusalem municipal district, in a move not internationally recognized. Shuafat lies about 6 kilometres north of Jerusalem's oldest historical part, the so-called City of David, and about 5 kilometres north of the walled Old City. What is today Shuafat laid outside the settlement area of its neighbour, Jerusalem, throughout the Bronze Age and until Jerusalem's destruction in 70 CE, and even outside Jerusalem's main Second Temple period northern necropolis. Shuafat is officially described in archaeological terms as being "in the vicinity of Jerusalem". It has an intermittent settlement history, in part from periods other than Jerusalem's, with architectural findings from the Chalcolithic, the Second Temple period (2nd–1st century BCE, a fortified agricultural settlement) and the short period between the end of the First Jewish–Roman War (66–70) and the Bar Kokhba revolt (132–135), being re-inhabited on a smaller scale during the 2nd–4th centuries CE. The South-Eastern Hill, also known as the City of David, is the initial nucleus of historical Jerusalem. There, the Gihon Spring attracted shepherds who camped near the water between 6 and 7000 years ago, leaving behind ceramics and flint artifacts during the Chalcolithic, or Copper Age (c. 4500–3500 BCE). Permanent houses only appeared several centuries later, with a small village emerging around 3000–2800 BCE, during the Early Bronze Age I or II. The first settlement lay on what some call the Ophel ridge. The city's inhabitants at this time were Canaanites, who are believed by scholars to have evolved into the Israelites via the development of a distinct Yahweh-centric monotheistic belief system. The Execration Texts (c. 19th century BCE), which refer to a city called rwš3lmm, variously transcribed as Rušalimum/Urušalimum/Rôsh-ramen and the Amarna letters (c. 14th century BCE) may be the earliest mention of the city. Nadav Na'aman argues its fortification as the centre of a kingdom dates to around the 18th century BCE. In the Late Bronze Age, Jerusalem was the capital of an Egyptian vassal city-state, a modest settlement governing a few outlying villages and pastoral areas, with a small Egyptian garrison and ruled by appointees such as king Abdi-Heba, At the time of Seti I (r. 1290–1279 BCE) and Ramesses II (r. 1279–1213 BCE), major construction took place as prosperity increased. Archaeological remains from the ancient Israelite period include the Siloam Tunnel, an aqueduct built by Judahite king Hezekiah and once containing an ancient Hebrew inscription, known as the Siloam Inscription; the so-called Broad Wall, a defensive fortification built in the 8th century BCE, also by Hezekiah; the Silwan necropolis with the Monolith of Silwan and the Tomb of the Royal Steward, which were decorated with monumental Hebrew inscriptions; and the so-called Israelite Tower, remnants of ancient fortifications, built from large, sturdy rocks with carved cornerstones. A huge water reservoir dating from this period was discovered in 2012 near Robinson's Arch, indicating the existence of a densely built-up quarter across the area west of the Temple Mount during the Kingdom of Judah. When the Assyrians conquered the Kingdom of Israel in 722 BCE, Jerusalem was strengthened by a great influx of refugees from the northern kingdom. The First Temple period ended around 586 BCE, as the Babylonians conquered Judah and Jerusalem, and laid waste to Solomon's Temple and the city. This period, when Canaan formed part of the Egyptian empire, corresponds in biblical accounts to Joshua's invasion, but almost all scholars agree that the Book of Joshua holds little historical value for early Israel. In the Bible, Jerusalem is defined as lying within territory allocated to the tribe of Benjamin though occupied by Jebusites. David is said to have conquered these in the Siege of Jebus, and transferred his capital from Hebron to Jerusalem which then became the capital of a united Kingdom of Israel, and one of its several religious centres. The choice was perhaps dictated by the fact that Jerusalem did not form part of Israel's tribal system, and was thus suited to serve as the centre of its federation. Opinion is divided over whether the so-called Large Stone Structure and the nearby Stepped Stone Structure may be identified with King David's palace, or dates to a later period. According to the Bible, King David reigned for 40 years and was succeeded by his son Solomon, who built the Holy Temple on Mount Moriah. 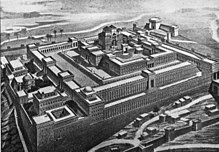 Solomon's Temple (later known as the First Temple), went on to play a pivotal role in Jewish religion as the repository of the Ark of the Covenant. On Solomon's death, ten of the northern Tribes of Israel broke with the United Monarchy to form their own nation, with its kings, prophets, priests, traditions relating to religion, capitals and temples in northern Israel. The southern tribes, together with the Aaronid priesthood, remained in Jerusalem, with the city becoming the capital of the Kingdom of Judah. In the 5th century, the eastern continuation of the Roman Empire, ruled from the recently renamed Constantinople, maintained control of the city. Within the span of a few decades, Jerusalem shifted from Byzantine to Persian rule, then back to Roman-Byzantine dominion. 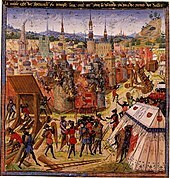 Following Sassanid Khosrau II's early 7th century push through Syria, his generals Shahrbaraz and Shahin attacked Jerusalem (Persian: Dej Houdkh‎) aided by the Jews of Palaestina Prima, who had risen up against the Byzantines. In 1244, Jerusalem was sacked by the Khwarezmian Tatars, who decimated the city's Christian population and drove out the Jews. The Khwarezmian Tatars were driven out by the Ayyubids in 1247. When Nachmanides visited in 1267 he found only two Jewish families, in a population of 2,000, 300 of whom were Christians, in the city. From 1260 to 1517, Jerusalem was ruled by the Mamluks. In the wider region and until around 1300, many clashes occurred between the Mamluks on one side, and the crusaders and the Mongols, on the other side. The area also suffered from many earthquakes and black plague. 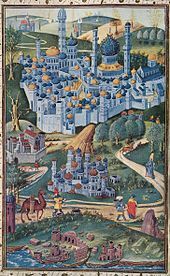 In 1517, Jerusalem and environs fell to the Ottoman Turks, who generally remained in control until 1917. Jerusalem enjoyed a prosperous period of renewal and peace under Suleiman the Magnificent—including the rebuilding of magnificent walls around the Old City. Throughout much of Ottoman rule, Jerusalem remained a provincial, if religiously important center, and did not straddle the main trade route between Damascus and Cairo. The English reference book Modern history or the present state of all nations, written in 1744, stated that "Jerusalem is still reckoned the capital city of Palestine, though much fallen from its ancient grandeaur". In the 1860s, new neighborhoods began to develop outside the Old City walls to house pilgrims and relieve the intense overcrowding and poor sanitation inside the city. The Russian Compound and Mishkenot Sha'ananim were founded in 1860, followed by many others that included Mahane Israel (1868), Nahalat Shiv'a (1869), German Colony (1872), Beit David (1873), Mea Shearim (1874), Shimon HaZadiq (1876), Beit Ya'aqov (1877), Abu Tor (1880s), American-Swedish Colony (1882), Yemin Moshe (1891), and Mamilla, Wadi al-Joz around the turn of the century. In 1867 an American Missionary reports an estimated population of Jerusalem of 'above' 15,000, with 4,000 to 5,000 Jews and 6,000 Muslims. Every year there were 5,000 to 6,000 Russian Christian Pilgrims. In 1872 Jerusalem became the center of a special administrative district, independent of the Syria Vilayet and under the direct authority of Istanbul called the Mutasarrifate of Jerusalem. The British had to deal with a conflicting demand that was rooted in Ottoman rule. Agreements for the supply of water, electricity, and the construction of a tramway system—all under concessions granted by the Ottoman authorities—had been signed by the city of Jerusalem and a Greek citizen, Euripides Mavromatis, on 27 January 1914. Work under these concessions had not begun and, by the end of the war the British occupying forces refused to recognize their validity. Mavromatis claimed that his concessions overlapped with the Auja Concession that the government had awarded to Rutenberg in 1921 and that he had been deprived of his legal rights. The Mavromatis concession, in effect despite earlier British attempts to abolish it, covered Jerusalem and other localities (e.g., Bethlehem) within a radius of 20 km (12 miles) around the Church of the Holy Sepulchre. In 1967, despite Israeli pleas that Jordan remain neutral during the Six-Day War, Jordan, which had concluded a defense agreement with Egypt on May 30, 1967, attacked Israeli-held West Jerusalem on the war's second day. After hand-to-hand fighting between Israeli and Jordanian soldiers on the Temple Mount, the Israel Defense Forces captured East Jerusalem, along with the entire West Bank. On 27 June 1967, three weeks after the war ended, in the reunification of Jerusalem, Israel extended its law and jurisdiction to East Jerusalem, including the city's Christian and Muslim holy sites, along with some nearby West Bank territory which comprised 28 Palestinian villages, incorporating it into the Jerusalem Municipality, although it carefully avoided using the term annexation. On 10 July, Foreign Minister Abba Eban explained to the UN Secretary General: "The term 'annexation' which was used by supporters of the vote is not accurate. The steps that were taken [by Israel] relate to the integration of Jerusalem in administrative and municipal areas, and served as a legal basis for the protection of the holy places of Jerusalem." Israel conducted a census of Arab residents in the areas annexed. Residents were given permanent residency status and the option of applying for Israeli citizenship. Since 1967, new Jewish residential areas have mushroomed in the eastern sector, while no new Palestinian neighbourhoods have been created. Jewish and Christian access to the holy sites inside the old walled city was restored. Israel left the Temple Mount under the jurisdiction of an Islamic waqf, but opened the Western Wall to Jewish access. The Moroccan Quarter, which was located adjacent to the Western Wall, was evacuated and razed to make way for a plaza for those visiting the wall. On 18 April 1968, an expropriation order by the Israeli Ministry of Finance more than doubled the size of the Jewish Quarter, evicting its Arab residents and seizing over 700 buildings of which 105 belonged to Jewish inhabitants prior to the Jordanian occupation of the city. The order designated these areas for public use, but they were intended for Jews alone. The government offered 200 Jordanian dinars to each displaced Arab family. From 1949 until 1967, West Jerusalem served as Israel's capital, but was not recognized as such internationally because UN General Assembly Resolution 194 envisaged Jerusalem as an international city. As a result of the Six-Day War in 1967, the whole of Jerusalem came under Israeli control. On 27 June 1967, the government of Levi Eshkol extended Israeli law and jurisdiction to East Jerusalem, but agreed that administration of the Temple Mount compound would be maintained by the Jordanian waqf, under the Jordanian Ministry of Religious Endowments. In 1988, Israel ordered the closure of Orient House, home of the Arab Studies Society, but also the headquarters of the Palestine Liberation Organization, for security reasons. The building reopened in 1992 as a Palestinian guesthouse. The Oslo Accords stated that the final status of Jerusalem would be determined by negotiations with the Palestinian Authority. The accords banned any official Palestinian presence in the city until a final peace agreement, but provided for the opening of a Palestinian trade office in East Jerusalem. The Palestinian Authority regards East Jerusalem as the capital of a future Palestinian state. President Mahmoud Abbas has said that any agreement that did not include East Jerusalem as the capital of Palestine would be unacceptable. Israeli Prime Minister Benjamin Netanyahu has similarly stated that Jerusalem would remain the undivided capital of Israel. Due to its proximity to the city, especially the Temple Mount, Abu Dis, a Palestinian suburb of Jerusalem, has been proposed as the future capital of a Palestinian state by Israel. Israel has not incorporated Abu Dis within its security wall around Jerusalem. The Palestinian Authority has built a possible future parliament building for the Palestinian Legislative Council in the town, and its Jerusalem Affairs Offices are all located in Abu Dis. On 5 December 1949, Israel's first Prime Minister, David Ben-Gurion, proclaimed Jerusalem as Israel's "eternal" and "sacred" capital, and eight days later specified that only the war had "compelled" the Israeli leadership "to establish the seat of Government in Tel Aviv", while "for the State of Israel there has always been and always will be one capital only – Jerusalem the Eternal", and that after the war, efforts had been ongoing for creating the conditions for "the Knesset... returning to Jerusalem." This indeed took place, and since the beginning of 1950 all branches of the Israeli government—legislative, judicial, and executive—have resided there, except for the Ministry of Defense, which is located at HaKirya in Tel Aviv. At the time of Ben Gurion's proclamations and the ensuing Knesset vote of 24 January 1950, Jerusalem was divided between Israel and Jordan, and thus the proclamation only applied to West Jerusalem. In July 1980, Israel passed the Jerusalem Law as Basic Law. The law declared Jerusalem the "complete and united" capital of Israel. The Jerusalem Law was condemned by the international community, which did not recognize Jerusalem as the capital of Israel. The United Nations Security Council passed Resolution 478 on 20 August 1980, which declared that the Jerusalem Law is "a violation of international law", is "null and void and must be rescinded forthwith". Member states were called upon to withdraw their diplomatic representation from Jerusalem. Following the resolution, 22 of the 24 countries that previously had their embassy in (West) Jerusalem relocated them in Tel Aviv, where many embassies already resided prior to Resolution 478. Costa Rica and El Salvador followed in 2006. Currently, there are two embassies—United States and Guatemala—and two consulates located within the city limits of Jerusalem, and two Latin American states maintain embassies in the Jerusalem District town of Mevaseret Zion (Bolivia and Paraguay). There are a number of consulates-general located in Jerusalem, which work primarily either with Israel, or the Palestinian authorities. 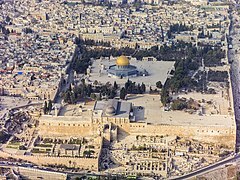 In 1995, the United States Congress passed the Jerusalem Embassy Act, which required, subject to conditions, that its embassy be moved from Tel Aviv to Jerusalem. On 6 December 2017 U.S. President Donald Trump officially recognized Jerusalem as Israel's capital and announced his intention to move the American embassy to Jerusalem, reversing decades of United States policy on the issue. The move was criticized by many nations. A resolution condemning the US decision was supported by all the 14 other members of the UN Security Council, but was vetoed by the US on 18 December 2017, and a subsequent resolution condemning the US decision was passed in the United Nations General Assembly. On 14 May 2018, the United States officially moved the location of its embassy to Jerusalem, transforming its Tel Aviv location into a consulate. Due to the general lack of international recognition of Jerusalem as Israel's capital, some non-Israeli media outlets use Tel Aviv as a metonym for Israel. In April 2017, the Russian Foreign Ministry announced it viewed Western Jerusalem as Israel's capital in the context of UN-approved principles which include the status of East Jerusalem as the capital of the future Palestinian state. On 15 December 2018, Australia officially recognized West Jerusalem as Israel's capital, but said their embassy in Tel Aviv would stay until a two-state resolution was settled. Many national institutions of Israel are located in Kiryat HaMemshala in Givat Ram in Jerusalem as a part of the Kiryat HaLeom project which is intended to create a large district that will house most government agencies and national cultural institutions. Some government buildings are located in Kiryat Menachem Begin. The city is home to the Knesset, the Supreme Court, the Bank of Israel, the National Headquarters of the Israel Police, the official residences of the President and Prime Minister, the Cabinet, and all ministries except for the Ministry of Defense (which is located in central Tel Aviv's HaKirya district) and the Ministry of Agriculture and Rural Development (which is located in Rishon LeZion, in the wider Tel Aviv metropolitan area, near Beit Dagan). The Jerusalem City Council is a body of 31 elected members headed by the mayor, who serves a five-year term and appoints eight deputies. The former mayor of Jerusalem, Uri Lupolianski, was elected in 2003. In the November 2008 city elections, Nir Barkat was elected. In November 2018, Moshe Lion was elected mayor. Apart from the mayor and his deputies, City Council members receive no salaries and work on a voluntary basis. The longest-serving Jerusalem mayor was Teddy Kollek, who spent 28 years—-six consecutive terms-—in office. Most of the meetings of the Jerusalem City Council are private, but each month, it holds a session that is open to the public. Within the city council, religious political parties form an especially powerful faction, accounting for the majority of its seats. The headquarters of the Jerusalem Municipality and the mayor's office are at Safra Square (Kikar Safra) on Jaffa Road. The municipal complex, comprising two modern buildings and ten renovated historic buildings surrounding a large plaza, opened in 1993 moved from the Jerusalem Historical City Hall Building. The city falls under the Jerusalem District, with Jerusalem as the district's capital. 37% of the population is Palestinian, but only 10% of tax revenues are allocated for them. In East Jerusalem, 52% of the land is excluded from development, 35% designated for Jewish settlements, and 13% for Palestinian use, almost all of which is already built on. The city is characterized by a hot-summer Mediterranean climate (Köppen: Csa ), with hot, dry summers, and mild, wet winters. Snow flurries usually occur once or twice a winter, although the city experiences heavy snowfall every three to four years, on average, with short-lived accumulation. Between 1838 and 1876, a number of estimates exist which conflict as to whether Jews or Muslims were the largest group during this period, and between 1882 and 1922 estimates conflict as to exactly when Jews became an absolute majority of the population. In 2005, the total population grew by 13,000 (1.8%)—similar to the Israeli national average, but the religious and ethnic composition is shifting. While 31% of the Jewish population is made up of children below the age fifteen, the figure for the Arab population is 42%. This would seem to corroborate the observation that the percentage of Jews in Jerusalem has declined over the past four decades. In 1967, Jews accounted for 74 percent of the population, while the figure for 2006 is down nine percent. Possible factors are the high cost of housing, fewer job opportunities and the increasingly religious character of the city, although proportionally, young Haredim are leaving in higher numbers. The percentage of secular Jews, or those who 'wear their faith lightly' is dropping, with some 20,000 leaving the city over the past seven years (2012). They now number 31% of the population, the same percentage as the rising Haredi population. Many move to the suburbs and coastal cities in search of cheaper housing and a more secular lifestyle. In 2009, the percentage of Haredim in the city was increasing. 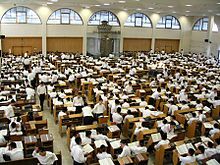 As of 2009[update], out of 150,100 schoolchildren, 59,900 or 40% are in state-run secular and National Religious schools, while 90,200 or 60% are in Haredi schools. This correlates with the high number of children in Haredi families. Jerusalem has been sacred to the Jews since King David proclaimed it his capital in the 10th century BCE. [note 5] Jerusalem was the site of Solomon's Temple and the Second Temple. Although not mentioned in the Torah / Pentateuch, it is mentioned in the Bible 632 times. Today, the Western Wall, a remnant of the wall surrounding the Second Temple, is a Jewish holy site second only to the "Holy of Holies" on the Temple Mount itself. Synagogues around the world are traditionally built with the Holy Ark facing Jerusalem, and Arks within Jerusalem face the Holy of Holies. As prescribed in the Mishna and codified in the Shulchan Aruch, daily prayers are recited while facing towards Jerusalem and the Temple Mount. Many Jews have "Mizrach" plaques hung on a wall of their homes to indicate the direction of prayer. Jerusalem is served by Ben Gurion Airport, some 50 kilometres (31 miles) northwest of the Jerusalem, on the route to Tel Aviv. In the past it was also served by the local Atarot Airport. Atarot ceased operation in 2000. Although Jerusalem is known primarily for its religious significance, the city is also home to many artistic and cultural venues. The Israel Museum attracts nearly one million visitors a year, approximately one-third of them tourists. The 20-acre (81,000 m2) museum complex comprises several buildings featuring special exhibits and extensive collections of Judaica, archaeological findings, and Israeli and European art. The Dead Sea scrolls, discovered in the mid-20th century in the Qumran Caves near the Dead Sea, are housed in the Museum's Shrine of the Book. The Youth Wing, which mounts changing exhibits and runs an extensive art education program, is visited by 100,000 children a year. The museum has a large outdoor sculpture garden and a scale-model of the Second Temple. The Ticho House in downtown Jerusalem houses the paintings of Anna Ticho and the Judaica collections of her husband, an ophthalmologist who opened Jerusalem's first eye clinic in this building in 1912. Next to the Israel Museum is the Bible Lands Museum, near The National Campus for the Archaeology of Israel, which includes the Israel Antiquities Authority offices. A World Bible Center is planned to be built adjacent to Mount Zion at a site called the "Bible Hill". A planned World Kabbalah Center is to be located on the nearby promenade, overlooking the Old City. The Rockefeller Museum, located in East Jerusalem, was the first archaeological museum in the Middle East. 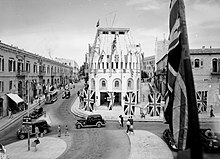 It was built in 1938 during the British Mandate. In 2006, a 38 km (24 mi) Jerusalem Trail was opened, a hiking trail that goes to many cultural sites and national parks in and around Jerusalem. 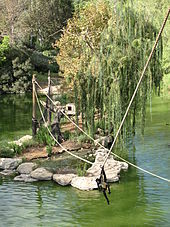 The Jerusalem Biblical Zoo has ranked consistently as Israel's top tourist attraction for Israelis. The Jerusalem Symphony Orchestra, established in the 1940s, has appeared around the world. The International Convention Center (Binyanei HaUma) near the entrance to city houses the Israel Philharmonic Orchestra. The Jerusalem Cinemateque, the Gerard Behar Center (formerly Beit Ha'Am) in downtown Jerusalem, the Jerusalem Music Center in Yemin Moshe, and the Targ Music Center in Ein Kerem also present the arts. The Israel Festival, featuring indoor and outdoor performances by local and international singers, concerts, plays, and street theater has been held annually since 1961, and Jerusalem has been the major organizer of this event. The Jerusalem Theater in the Talbiya neighborhood hosts over 150 concerts a year, as well as theater and dance companies and performing artists from overseas. The Khan Theater, located in a caravanserai opposite the old Jerusalem train station, is the city's only repertoire theater. The station itself has become a venue for cultural events in recent years as the site of Shav'ua Hasefer (an annual week-long book fair) and outdoor music performances. The Jerusalem Film Festival is held annually, screening Israeli and international films. In 1974 the Jerusalem Cinematheque was founded. In 1981 it was moved to a new building on Hebron Road near the Valley of Hinnom and the Old City. The Museum on the Seam, which explores issues of coexistence through art, is situated on the road dividing eastern and western Jerusalem. The Abraham Fund and the Jerusalem Intercultural Center (JICC) promote joint Jewish-Palestinian cultural projects. The Jerusalem Center for Middle Eastern Music and Dance is open to Arabs and Jews and offers workshops on Jewish-Arab dialogue through the arts. The Jewish-Arab Youth Orchestra performs both European classical and Middle Eastern music. In 2008, the Tolerance Monument, an outdoor sculpture by Czesław Dźwigaj, was erected on a hill between Jewish Armon HaNetziv and Arab Jebl Mukaber as a symbol of Jerusalem's quest for peace. ^ The State of Palestine (according to the Basic Law of Palestine, Title One: Article 3) regards Jerusalem as its capital. But the documents of the PLO's Negotiations Affairs Department (NAD) often refer to East Jerusalem (rather than the whole of Jerusalem) as a future capital, and sometimes as the current capital. One of its 2010 documents, described as "for discussion purposes only", says that Palestine has a '"vision"' for a future in which "East Jerusalem ... shall be the capital of Palestine, and West Jerusalem shall be the capital of Israel", and one of its 2013 documents refers to "Palestine's capital, East Jerusalem", and states that "Occupied East Jerusalem is the natural socio-economic and political center for the future Palestinian state", while also stating that "Jerusalem has always been and remains the political, administrative and spiritual heart of Palestine" and that "The Palestinian acceptance of the 1967 border, which includes East Jerusalem, is a painful compromise". ^ In other languages: official Arabic in Israel: Arabic: أورشليم القدس‎, translit. Ûrshalîm-Al Quds (combining the Biblical and common usage Arabic names); Ancient Greek: Ἱερουσαλήμ/Ἰεροσόλυμα, translit. Hierousalḗm/Hierosóluma; Armenian: Երուսաղեմ, translit. Erusałēm. ^ Jerusalem is the capital under Israeli law. The presidential residence, government offices, supreme court and parliament (Knesset) are located there. The State of Palestine (according to the Basic Law of Palestine, Title One: Article 3) regards Jerusalem as its capital. The UN and most countries do not recognize Jerusalem as Israel's capital, taking the position that the final status of Jerusalem is pending future negotiations between Israel and the Palestinian Authority. 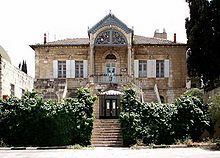 Most countries maintain their embassies in Tel Aviv and its suburbs or suburbs of Jerusalem, such as Mevaseret Zion (see CIA Factbook and "Map of Israel" (PDF). (319 KB)) See Status of Jerusalem for more information. ^ a b Much of the information regarding King David's conquest of Jerusalem comes from Biblical accounts, but some modern-day historians have begun to give them credit due to a 1993 excavation. ^ West Jerusalem comprises approximately one third of the current municipal area of Jerusalem, with East Jerusalem comprising approximately two thirds. On the annexation of East Jerusalem, Israel also incorporated an area of the West Bank into the Jerusalem municipal area which represented more than ten times the area of East Jerusalem under Jordanian rule. ^ "Jerusalem Non-Paper" (PDF). PLO-NAD. June 2010. Archived from the original (PDF) on 6 February 2012. Retrieved 25 July 2018. ^ "Statements and Speeches". nad-plo.org. p. 2. Archived from the original on 18 April 2016. Retrieved 25 November 2014. This paper is for discussion purposes only. Nothing is agreed until everything is agreed. Pursuant to our vision, East Jerusalem, as defined by its pre-1967 occupation municipal borders, shall be the capital of Palestine, and West Jerusalem shall be the capital of Israel, with each state enjoying full sovereignty over its respective part of the city. ^ "East Jerusalem today – Palestine's Capital: The 1967 border in Jerusalem and Israel's illegal policies on the ground" (PDF). PLO-Negotiations Affairs Department (NAD). August 2013. Archived from the original (PDF) on 4 March 2016. Retrieved 25 November 2014. ... Palestine's capital, East Jerusalem ... The Palestinian acceptance of the 1967 border, which includes East Jerusalem, is a painful compromise: ... Jerusalem has always been and remains the political, administrative and spiritual heart of Palestine. Occupied East Jerusalem is the natural socio-economic and political center for the future Palestinian state. ^ "Localities, Population and Density per Sq. Km., by Metropolitan Area and Selected Localities". Israel Central Bureau of Statistics. 6 September 2017. Retrieved 19 September 2017. ^ "Facts and Figures". jerusalem.muni.il. Archived from the original on 31 October 2016. ^ Sub-national HDI. "Area Database". hdi.globaldatalab.org. Global Data Lab. ^ Smith, William (6 December 2017). "Donald Trump confirms US will recognise Jerusalem as capital of Israel". Guardian. Retrieved 13 May 2017. ^ "Do We Divide the Holiest Holy City?". Moment Magazine. Archived from the original on 3 June 2008. Retrieved 5 March 2008. According to Eric H. Cline's tally in Jerusalem Besieged. ^ a b c d Greenberg, Raphael; Mizrachi, Yonathan (10 September 2013). "From Shiloah to Silwan – A Visitor's Guide". Emek Shaveh. Retrieved 25 July 2018. ^ Moore, Megan Bishop; Kelle, Brad E. (17 May 2011). "Biblical History and Israel's Past: The Changing Study of the Bible and History". Wm. B. Eerdmans Publishing – via Google Books. ^ "Old City of Jerusalem and its Walls". UNESCO World Heritage Convention. Retrieved 11 September 2010. ^ Tom Teicholz (20 July 2015). "Mr. Jerusalem: Nir Hasson of Haaretz's 'The Jerusalem Blog'". Forbes Israel. Retrieved 4 August 2017. ^ a b Laub, Karin (2 December 2006). "Jerusalem Barrier Causes Major Upheaval". The Associated Press via The Washington Post. Retrieved 10 March 2007. ^ a b "Selected Data on the Occasion of Jerusalem Day" (PDF). Israel Central Bureau of Statistics. 16 May 2012. Retrieved 3 January 2014. ^ "Basic Facts you should know: Jerusalem". Anti-Defamation League. 2007. Archived from the original on 4 January 2013. Retrieved 28 March 2007. The Jewish people are inextricably bound to the city of Jerusalem. No other city has played such a dominant role in the history, politics, culture, religion, national life and consciousness of a people as has Jerusalem in the life of Jewry and Judaism. Since King David established the city as the capital of the Jewish state circa 1000 BCE, it has served as the symbol and most profound expression of the Jewish people's identity as a nation." ^ Reinoud Oosting, The Role of Zion/Jerusalem in Isaiah 40–55: A Corpus-Linguistic Approach, p. 117, at Google Books Brill 2012 pp. 117–118. Isaiah 48:2;51:1; Nehemiah 11:1,18; cf. Joel 4:17: Daniel 5:24. The Isaiah section where they occur belong to deutero-Isaiah. ^ Shalom M. Paul, Isaiah 40–66, p. 306, at Google Books Wm. B. Eerdmans Publishing, 2012 p. 306. The 'holiness' (qodesh) arises from the temple in its midst, the root q-d-š referring to a sanctuary. The concept is attested in Mesopotamian literature, and the epithet may serve to distinguish Babylon, the city of exiles, from the city of the Temple, to where they are enjoined to return. ^ Golb, Norman (1997). "Karen Armstrong's Jerusalem—One City, Three Faiths". The Bible and Interpretation. Retrieved 10 July 2013. The available texts of antiquity indicate that the concept was created by one or more personalities among the Jewish spiritual leadership, and that this occurred no later than the 6th century B.C. ^ Buchanan, Allen (2004). States, Nations, and Borders: The Ethics of Making Boundaries. Cambridge University Press. ISBN 0-521-52575-6. Retrieved 9 June 2008. ^ "Israel plans 1,300 East Jerusalem Jewish settler homes". BBC News. 9 November 2010. East Jerusalem is regarded as occupied Palestinian territory by the international community, but Israel says it is part of its territory. ^ "Israeli authorities back 600 new East Jerusalem homes". BBC News. 26 February 2010. Retrieved 18 September 2013. ^ a b Bisharat, George (2010). "Maximizing Rights". In Susan M. Akram; Michael Dumper; Michael Lynk (eds.). International Law and the Israeli-Palestinian Conflict: A Rights-Based Approach to Middle East Peace. Routledge. p. 311. ISBN 978-1-136-85098-1. As we have noted previously the international legal status of Jerusalem is contested and Israel's designation of it as its capital has not been recognized by the international community. However its claims of sovereign rights to the city are stronger with respect to West Jerusalem than with respect to East Jerusalem. ^ Moshe Hirsch; Deborah Housen-Couriel; Ruth Lapidot (1995). Whither Jerusalem? : Proposals and Positions Concerning the Future of Jerusalem. Martinus Nijhoff Publishers. p. 15. ISBN 90-411-0077-6. What, then, is Israel's status in west Jerusalem? Two main answers have been adduced: (a) Israel has sovereignty in this area; and (b) sovereignty lies with the Palestinian people or is suspended. ^ David Noel Freedman; Allen C. Myers; Astrid B. Beck (2000). Eerdmans dictionary of the Bible. Wm. B. Eerdmans Publishing. pp. 694–695. ISBN 978-0-8028-2400-4. Retrieved 19 August 2010. Nadav Na'aman, Canaan in the 2nd Millennium B.C.E., Eisenbrauns, 2005 pp. 177ff. offers a dissenting opinion, arguing for the transcription Rôsh-ramen, etymologized to r'š (head) and rmm (be exalted), to mean 'the exalted Head', and not referring to Jerusalem. ^ "The El Amarna Letters from Canaan". TAU.ac.il. Retrieved 11 September 2010. ^ a b Binz, Stephen J. (2005). Jerusalem, the Holy City. Connecticut: Twenty-Third Publications. p. 2. ISBN 9781585953653. Retrieved 17 December 2011. ^ Elon, Amos. Jerusalem. HarperCollins Publishers Ltd. ISBN 0-00-637531-6. Archived from the original on 10 March 2003. Retrieved 26 April 2007. The epithet may have originated in the ancient name of Jerusalem—Salem (after the pagan deity of the city), which is etymologically connected in the Semitic languages with the words for peace (shalom in Hebrew, salam in Arabic). ^ Hastings, James (2004). A Dictionary of the Bible: Volume II: (Part II: I – Kinsman), Volume 2. Honolulu, Hawaii: Reprinted from 1898 edition by University Press of the Pacific. p. 584. ISBN 1-4102-1725-6. Retrieved 17 December 2011. ^ a b Bosworth, Clifford Edmund (2007). Historic cities of the Islamic world. The Netherlands: Koninklijke Brill NV. pp. 225–226. ISBN 90-04-15388-8. Retrieved 17 December 2011. ^ a b Denise DeGarmo (9 September 2011). "Abode of Peace?". Wandering Thoughts. Center for Conflict Studies. Archived from the original on 26 April 2012. Retrieved 17 December 2011. ^ Bosworth, Francis Edward (1968). Millennium: a Latin reader, A. Oxford, United Kingdom: Oxford University Press. p. 183. ASIN B0000CO4LE. Retrieved 17 December 2011. ^ Ginzberg, Louis (1909). The Legends of the Jews Volume I: The Akedah (Translated by Henrietta Szold) Philadelphia: Jewish Publication Society. ^ "Bible, King James Version". umich.edu. Retrieved 12 February 2016. ^ 2 Samuel 5:7,9. cited Israel Finkelstein, Amihay Mazar, Brian B. Schmidt, (eds) The Quest for the Historical Israel, Society of Biblical Literature, 2007 p. 127. ^ Bar-Kochva, Bezalel (2002). Judas Maccabeus: The Jewish Struggle Against the Seleucids. Cambridge: Cambridge University Press. p. 447. ISBN 0-521-01683-5. ^ Mazar, Eilat (2002). The Complete Guide to the Temple Mount Excavations. Jerusalem: Shoham Academic Research and Publication. p. 1. ISBN 965-90299-1-8. ^ E.g., the Vulgate and Peshitta versions. J.A. Emerton, "The site of Salem: the City of Melchizedek (Genesis xiv 18)," pp. 45–72 of Studies in the Pentateuch ed. by J.A. Emerton, vol. 41 of Supplements to Vetus Testamentum (Leiden: E.J. Brill, 1990) ("Emerton"), p. 45. See also John 3:23 where "Salim" or "Sylem" (Συχὲμ) is said to be near Ænon, thought to be in the valley of Mount Ebal, one of two mountains in the vicinity of Nablus. ^ Genesis 12:6–7 (where Abram built an altar), Genesis 33:18–20, Deuteronomy 11:29 & 28:11, Joshua 8:33, 1 Kings 12. Emerton, p. 63. ^ Paul Winter, "Note on Salem – Jerusalem", Novum Testamentum, vol. 2, pp. 151–152 (1957). ^ Raymond Hayward. "Melchizedek as Priest of the Jerusalem Temple in Talmud, Midrash, and Targum" (PDF). The Temple Studies Group. Retrieved 24 January 2015. ^ "The Official Website of Jerusalem". Municipality of Jerusalem. 19 September 2011. Archived from the original on 27 April 2007. ^ Sonbol, Amira (1996). Women, the Family, and Divorce Laws in Islamic History. p. 133. ^ The Associated Press (17 February 2016). "Israeli Archaeologists Discover 7,000-Year-Old Settlement". The New York Times. The New York Times Company. Archived from the original on 29 February 2016. Retrieved 25 July 2018. ^ "For three thousand years, Jerusalem has been the center of Jewish hope and longing. No other city has played such a dominant role in the history, culture, religion and consciousness of a people as has Jerusalem in the life of Jewry and Judaism. Throughout centuries of exile, Jerusalem remained alive in the hearts of Jews everywhere as the focal point of Jewish history, the symbol of ancient glory, spiritual fulfillment and modern renewal. This heart and soul of the Jewish people engenders the thought that if you want one simple word to symbolize all of Jewish history, that word would be 'Jerusalem.'" Teddy Kollek (DC: Washington Institute For Near East Policy, 1990), pp. 19–20. ^ John Quigley (1 July 1998). The Palestine Yearbook of International Law, 1996–1997. Martinus Nijhoff Publishers. pp. 32–. ISBN 90-411-1009-7. Palestine's claim to Jerusalem is founded on the longtime status of the Palestinian Arabs as the majority population of Palestine. On that basis the Palestinians claim sovereignty over all of Palestine. including Jerusalem, both East and West. The Palestinians claim descent from the Canaanites, the earliest recorded inhabitants of Palestine. Although political control changed hands many times through history, this population, which was Arabized by the Arab conquest of the seventh century A.D., remained into the twentieth century. ^ Isabel Kershner (5 June 2007). "Under a Divided City, Evidence of a Once United One". The New York Times. Retrieved 29 January 2008. ^ Noah Browning, 'In bleak Arab hinterland, hints of Jerusalem's partition,' Reuters 20 December 2013. ^ Negev, Avraham; Gibson, Shimon (2001). Jerusalem. Archaeological Encyclopedia of the Holy Land. New York and London: Continuum. pp. 260, 262, 264–265, 267. ISBN 0-8264-1316-1. ^ Israel Antiquities Authority (10 April 2007). "Remains of Jewish settlement revealed in the Shu'afat neighborhood of Jerusalem". Israel Ministry of Foreign Affairs website. Retrieved 28 July 2018. ^ Lee I. Levine (2005). The Ancient Synagogue (2nd. ed.). Yale University Press. p. 72. The case for a synagogue or prayer hall at this site appears to have evaporated. ^ Anders Runesson; Donald D. Binder; Birger Olsson (2008). The ancient synagogue from its origins to 200 A.D. Leiden: Brill. pp. 75–76. ^ Yeger, David (22 January 2017). "Jerusalem, Shuʽfat (A): Final Report". Hadashot Arkheologiyot – Excavations and Surveys in Israel (HA-ESI). Jerusalem: Israel Antiquities Authority (IAA). 129. Retrieved 28 July 2018. ^ a b c Negev, Avraham; Gibson, Shimon (2001). Jerusalem. Archaeological Encyclopedia of the Holy Land. New York and London: Continuum. pp. 260–261. ISBN 0-8264-1316-1. ^ a b c Freedman, David Noel (1 January 2000). Eerdmans Dictionary of the Bible. William B. Eerdmans Publishing Company. pp. 694–695. ISBN 0-8028-2400-5. 1. Ceramic evidence indicates some occupation of Ophel as early as early as the Chalcolithic period. 2. Remains of a building witness to a permanent settlement on Ophel during the early centuries (ca. 3000–2800 B.C.E.) of the Early Bronze Age. ^ Jerome Murphy-O'Connor, Keys to Jerusalem: Collected Essays, Oxford University Press, 2012 p. 4. ^ Nadav Na'aman, op.cit pp. 178–179. ^ Vaughn, Andrew G.; Ann E. Killebrew (1 August 2003). "Jerusalem at the Time of the United Monarchy". Jerusalem in Bible and Archaeology: the First Temple Period. Atlanta: Society of Biblical Literature. pp. 32–33. ISBN 1-58983-066-0. ^ Shalem, Yisrael (3 March 1997). "History of Jerusalem from its Beginning to David". Jerusalem: Life Throughout the Ages in a Holy City. Bar-Ilan University, Ingeborg Rennert Center for Jerusalem Studies. Retrieved 18 January 2007. ^ Nadav Naʼaman, Canaan in the 2nd Millennium B.C.E., p. 180. ^ Jane M. Cahill, 'Jerusalem at the time of the United Monarchy', in Andrew G. Vaughn, Ann E. Killebrew (eds.) Jerusalem in Bible and Archaeology: The First Temple Period, Society of Biblical Literature, 2003 p. 33. ^ Israel Finkelstein, Neil Asher Silberman, The Bible Unearthed: Archaeology's New Vision of Ancient Israel and the Origin of Sacred Texts, Simon and Schuster 2002 p. 239. ^ a b Jerome Murphy-O'Connor, Keys to Jerusalem: Collected Essays, Oxford University Press, 2012 pp. 5–6. ^ Robb Andrew Young, Hezekiah in History and Tradition, p. 49. ^ "The Broad Wall – Jerusalem Attractions, Israel". GoJerusalem.com. 3 December 2012. Retrieved 7 December 2012. ^ "Department of Archaeology – Silwan, Jerusalem: The Survey of the Iron Age Necropolis". TAU.ac.il. Retrieved 7 December 2012. ^ "The Israelite Tower". The Jewish Quarter. Archived from the original on 5 October 2012. Retrieved 7 December 2012. ^ Matti Friedman (6 September 2012). "Cistern dated to First Temple period found in Jerusalem". Times of Israel. ^ Zank, Michael. "Capital of Judah I (930–722)". Boston University. Retrieved 22 January 2007. ^ K. L. Noll, Canaan and Israel in Antiquity: An Introduction, Continuum Publishing, 2002 p. 78. ^ Nadav Naʼaman Canaan in the 2nd Millennium B.C.E., p. 183. ^ Israel Finkelstein, Neil Asher Silberman, The Bible Unearthed, p. 238. ^ Erlanger, Steven (5 August 2005). "King David's Palace Is Found, Archaeologist Says". The New York Times. Retrieved 24 May 2007. ^ Israel Finkelstein, Amihay Mazar, Brian B. Schmidt, (eds.) The Quest for the Historical Israel, Society of Biblical Literature, 2007 pp. 104, 113, 125–128, 165, 174. ^ 1 Samuel 31:1–13:2 Samuel 5:4–5; Finkelstein, Silberman, op.cit. p. 20. ^ a b Michael, E.; Sharon O. Rusten; Philip Comfort; Walter A. Elwell (28 February 2005). The Complete Book of When and Where: in the Bible and Throughout History. Tyndale House Publishers, Inc. pp. 20–21, 67. ISBN 0-8423-5508-1. ^ Merling, David (26 August 1993). "Where is the Ark of the Covenant?". Andrews University. Archived from the original on 17 September 2006. Retrieved 22 January 2007. ^ Richard A. Freund, Digging Through the Bible: Modern Archaeology and the Ancient Bible, p. 9, at Google Books, Rowman & Littlefield, 2009, p. 9. ^ Zank, Michael. "Capital of Judah (930–586)". Boston University. Retrieved 22 January 2007. ^ Sicker, Martin (30 January 2001). Between Rome and Jerusalem: 300 Years of Roman-Judaean Relations. Praeger Publishers. p. 2. ISBN 0-275-97140-6. ^ Zank, Michael. "Center of the Persian Satrapy of Judah (539–323)". Boston University. Retrieved 22 January 2007. ^ a b "Jerusalem – Burial Sites and Tombs of the Second Temple Period". Jewishvirtuallibrary.org. Retrieved 12 March 2013. ^ "Archaeological Sites in Israel-Jerusalem- Burial Sites and Tombs of the Second Temple Period". GxMSDev. Archived from the original on 31 July 2016. ^ Golden Jerusalem By Menashe Har-El. Retrieved 18 September 2013. ^ Hannah M. Cotton; Leah Di Segni; Werner Eck; Benjamin Isaac; Alla Kushnir-Stein; Haggai Misgav; Jonathan Price; Israel Roll; Ada Yardeni, eds. (23 December 2010). Jerusalem, Part 1: 1–704. Walter de Gruyter. p. 79. Retrieved 18 September 2013. ^ Har-el, Menashe (1977). This Is Jerusalem. Canaan Publishing House. pp. 68–95. ISBN 0-86628-002-2. ^ Zank, Michael. "The Temple Mount". Boston University. Retrieved 22 January 2007. ^ a b Lehmann, Clayton Miles (22 February 2007). "Palestine: History". The On-line Encyclopedia of the Roman Provinces. The University of South Dakota. Archived from the original on 10 March 2008. Retrieved 18 April 2007. ^ Cohen, Shaye J. D. (1996). "Judaism to Mishnah: 135–220 C.E". In Hershel Shanks (ed.). Christianity and Rabbinic Judaism: A Parallel History of their Origins and Early Development. Washington, DC: Biblical Archaeology Society. p. 196. ^ Gideon Avni, The Byzantine-Islamic Transition in Palestine: An Archaeological Approach, p. 144, at Google Books, Oxford University Press 2014 p. 144. ^ Horowitz, Elliot. "Modern Historians and the Persian Conquest of Jerusalem in 614". Jewish Social Studies. Archived from the original on 26 May 2008. Retrieved 20 January 2011. ^ Rodney Aist, The Christian Topography of Early Islamic Jerusalem, Brepols Publishers, 2009 p. 56: 'Persian control of Jerusalem lasted from 614 to 629'. ^ William Montgomery Watt (7 February 1974). Muhammad: prophet and statesman. Oxford University Press. pp. 112–113. ISBN 978-0-19-881078-0. Retrieved 29 December 2011. ^ Gil, Moshe (February 1997). A History of Palestine, 634–1099. Cambridge University Press. pp. 70–71. ISBN 0-521-59984-9. ^ Runciman, Steven (1951). A History of the Crusades:The First Crusade and the Foundation of the Kingdom of Jerusalem. 1. Penguin Books. 3–4. ISBN 0-521-34770-X. ^ a b Shalem, Yisrael. "The Early Arab Period – 638–1099". Ingeborg Rennert Center for Jerusalem Studies, Bar-Ilan University. Retrieved 20 July 2008. ^ Rivka Gonen, Contested holiness: Jewish, Muslim, and Christian perspectives on the Temple Mount in Jerusalem, Ktav Publishing House, 2003, p. 85; The History of al-Tabari, vol. XII, Albany: State University of New York Press 2007, pp. 194–195. ^ Hoppe, Leslie J. (August 2000). The Holy City: Jerusalem in the Theology of the Old Testament. Michael Glazier Books. p. 15. ISBN 0-8146-5081-3. ^ Zank, Michael. "Abbasid Period and Fatimid Rule (750–1099)". Boston University. Retrieved 1 February 2007. ^ Adrian J. Boas, Jerusalem in the Time of the Crusades, Routledge 2001, pp. 14, 35. ^ Hull, Michael D. (June 1999). "First Crusade: Siege of Jerusalem". Military History. Archived from the original on 30 September 2007. Retrieved 18 May 2007. ^ a b "Main Events in the History of Jerusalem". Jerusalem: The Endless Crusade. The CenturyOne Foundation. 2003. Retrieved 2 February 2007. ^ Abu-Lughod, Janet L.; Dumper, Michael (2007). Cities of the Middle East and North Africa: A Historical Encyclopedia. ABC-CLIO. p. 209. ISBN 978-1-57607-919-5. Retrieved 22 July 2009. ^ Larry H. Addington (1990). The Patterns of War Through the Eighteenth Century. Midland book. Indiana University Press. p. 59. ISBN 9780253205513. Retrieved 30 May 2014. in the Sixth Crusade, Frederick II ...concluded a treaty with the Saracens in 1229 that placed Jerusalem under Christian control but allowed Muslim and Christian alike freedom of access to the religious shrines of the city. ... Within fifteen years of Frederick's departure from the Holy Land, the Khwarisimian Turks, successors to the Seljuks, rampaged through Syria and Palestine, capturing Jerusalem in 1244. (Jerusalem would not be ruled again by Christians until the British occupied it in December 1917, during World War I). ^ Annabel Jane Wharton (2006). Selling Jerusalem: Relics, Replicas, Theme Parks. University of Chicago Press. p. 106. ISBN 9780226894225. Retrieved 30 May 2014. (footnote 19): It is perhaps worth noting that the same sultan, al-Malik al-Kamil, was later involved in the negotiations with Emperor Frederick II that briefly reestablished Latin control in Jerusalem between 1229 and 1244. ^ Hunt Janin, Four Paths to Jerusalem: Jewish, Christian, Muslim, and Secular Pilgrimages, 1000 BCE to 2001 CE, McFarland, 2002 p. 120. ^ Grove Encyclopedia of Islamic Art & Architecture: Three-Volume Set. Oxford University Press. p. 348. ISBN 9780195309911. Retrieved 30 May 2014. After 1260 Jerusalem was incorporated into the domains of the Mamluk Sultans of Egypt and Syria. ^ Michael Avi-Yonah, A History of Israel and the Holy Land, A&C Black, 2003 p. 279. ^ Salmon, Thomas (1744). Modern history or the present state of all nations. p. 461. Retrieved 28 January 2011. ^ a b "The Ottoman Period (1517–1917 CE)". Hebrew University. 2002. Archived from the original on 31 December 2009. Retrieved 24 July 2018. ^ Eylon, Lili (April 1999). "Jerusalem: Architecture in the Late Ottoman Period". Focus on Israel. Israel Ministry of Foreign Affairs. Archived from the original on 15 April 2007. Retrieved 20 April 2007. ^ Jankowski, James P. (1997). Rethinking Nationalism in the Arab Middle East. Columbia University Press. p. 174. ISBN 0231106955. ^ Jaffe, Eliezer David (1983). Israelis in Institutions: Studies in child placement, practice, and policy. Taylor & Francis. p. 3. ISBN 0-677-05960-4. ^ Fromkin, David (1 September 2001). A Peace to End All Peace: The Fall of the Ottoman Empire and the Creation of the Modern Middle East (2nd reprinted ed.). Owl Books e. pp. 312–313. ISBN 0-8050-6884-8. ^ "Chart of the population of Jerusalem". Focusonjerusalem.com. Retrieved 11 September 2010. ^ Tamari, Salim (1999). "Jerusalem 1948: The Phantom City". Jerusalem Quarterly File (3). Archived from the original (Reprint) on 9 September 2006. Retrieved 2 February 2007. ^ a b Eisenstadt, David (26 August 2002). "The British Mandate". Jerusalem: Life Throughout the Ages in a Holy City. Bar-Ilan University Ingeborg Rennert Center for Jerusalem Studies. Retrieved 10 February 2007. ^ a b "History". The Hebrew University of Jerusalem. Retrieved 18 March 2007. ^ "Considerations Affecting Certain of the Provisions of the General Assembly Resolution on the "Future Government of Palestine": The City of Jerusalem". The United Nations. 22 January 1948. Archived from the original on 26 January 2008. Retrieved 3 February 2007. ^ "U.N. Resolution 181 (II). (29 Nov 1947) Future government of Palestine". Archived from the original on 6 September 2015. Retrieved 6 September 2015. ^ a b Lapidoth, Ruth (30 June 1998). "Jerusalem: Legal and Political Background". Israel Ministry of Foreign Affairs. Archived from the original on 2 April 2013. Retrieved 22 July 2008. ^ Cattan, Henry (1981) Jerusalem. Croom Helm. ISBN 0-7099-0412-6. p. 51. Number of Arab districts under Jewish control. ^ "No Man's Land". Jposttravel.com. Archived from the original on 24 November 2010. Retrieved 11 September 2010. ^ Klein, Menachem (2002). "Chapter 5: Rule and Role in Jerusalem". In Breger, Marshall J.; Ahimeir, Ora (eds.). Jerusalem: A City and Its Future. Jerusalem Institute for Israel Studies, Syracuse University Press. p. 145. ISBN 0-8156-2912-5. Retrieved 14 October 2012. On 5 December 1948, Prime Minister Ben-Gurion claimed Jerusalem as part of Israel and eight days later the Israeli Knesset declared it the capital of Israel. ^ "Legal Status in Palestine". Birzeit University Institute of Law. Archived from the original on 3 November 2007. Retrieved 22 July 2008. ^ P. R. Kumaraswamy (March 2000). "Beyond the Veil: Israel-Pakistan Relations" (PDF). Tel Aviv, Israel: Jaffee Center for Strategic Studies, Tel Aviv University. Archived from the original (PDF) on 28 June 2007. Retrieved 22 July 2009. ^ Yitzhak Reiter (2008). Jerusalem and its role in Islamic solidarity. Palgrave Macmillan. p. 136. ISBN 978-0-230-60782-8. Retrieved 24 May 2011. According to Jordanian government sources, Jordan has spent about a billion dollars since 1954 on al-Aqsa renovations and maintenance. ^ "Mount of Olives, Jerusalem". mountofolives.co.il. Archived from the original on 12 February 2010. ^ Mark A. Tessler. "A History of the Israeli-Palestinian Conflict". Retrieved 17 May 2015. ^ Simone Ricca (2007). Reinventing Jerusalem: Israel's reconstruction of the Jewish Quarter after 1967. I.B.Tauris. p. 22. ISBN 978-1-84511-387-2. Retrieved 3 June 2011. ^ Al-Kuwayt, Jāmiʻat; Al-Filasṭīnīyah, Muʼassasat al-Dirāsāt (1978). "Institute for Palestine Studies and Kuwait University". Journal of Palestine Studies. Washington, DC: Institute For Palestine Studies. 7 (25–28): 194. ^ "Letter From The Permanent Representative Of Israel To The United Nations Addressed To The Secretary-General". United Nations. Archived from the original on 15 May 2011. Retrieved 11 September 2010. ^ Greg Noakes (September – October 1994). "Dispute Over Jerusalem Holy Places Disrupts Arab Camp". Washington Report on Middle East Affairs. Retrieved 20 July 2008. ^ John M. Oesterreicher; Anne Sinai (1974). Jerusalem. John Day. p. 26. ISBN 978-0-381-98266-9. ^ Doson, Nandita and Sabbah, Abdul Wahad (editors) Stories from our Mothers (2010). ISBN 978-0-9556136-3-0. pp. 18–19. ^ "13 Law and Administration Ordinance – Amendment No". Mfa.gov.il. Retrieved 2 June 2011. ^ a b Nathan Thrall, 'Rage in Jerusalem,' London Review of Books Vol. 36 No. 23 4 December 2014, pp. 19–21. ^ "Jerusalem's Holy Places and the Peace Process". The Washington Institute for Near East Policy. 1988. Retrieved 20 July 2008. ^ "facts and trends 2012" (PDF). Retrieved 12 March 2013. ^ Bowen, Jeremy (15 July 2010). "House-by-house struggle for East Jerusalem". BBC. Retrieved 11 September 2010. ^ "Abu Mazen's speechat the meeting of the PLO's Palestinian Central Council". UNISPAL. 9 September 2000. Archived from the original on 26 October 2011. Retrieved 25 July 2018. Oren-Nordheim, Michael; Ruth Kark (September 2001). Ruth Kark. Wayne State University Press. p. 36. ISBN 0-8143-2909-8. Archived from the original on 16 December 2007. Retrieved 17 April 2007. The three decades of British rule in Palestine (1917/18–1948) were a highly significant phase in the development, with indelible effects on the urban planning and development of the capital – Jerusalem. is a professor in the Department of Geography at the Hebrew University of Jerusalem. ^ Dore Gold. "Jerusalem in International Diplomacy". Retrieved 20 July 2008. ^ "The New Orient House: A History of Palestinian Hospitality". jerusalemites.org. Archived from the original on 17 December 2010. Retrieved 9 September 2011. ^ Klein, Menachem (March 2001). "The PLO and the Palestinian Identity of East Jerusalem". Jerusalem: The Future of a Contested City. New York University Press. p. 189. ISBN 0-8147-4754-X. ^ Segal, Jerome M. (Fall 1997). "Negotiating Jerusalem". The University of Maryland School of Public Policy. Archived from the original on 14 May 2006. Retrieved 25 February 2007. ^ Møller, Bjørn (November 2002). "A Cooperative Structure for Israeli–Palestinian Relations". Working Paper No. 1. Centre for European Policy Studies. Archived from the original (PDF) on 6 January 2004. Retrieved 16 April 2007. ^ "No agreement without a Palestinian capital in Jerusalem: Mahmoud Abbas". The Times of India. 10 June 2010. Retrieved 9 September 2011. ^ Bard, Mitchell G. Will Israel Survive? ^ Whither Jerusalem (Lapidot) page 17: "Israeli control in west Jerusalem since 1948 was illegal and most states have not recognized its sovereignty there"
^ Tzippe Barrow (25 October 2010). "Bill to Grant Jerusalem Priority Status – Inside Israel – CBN News – Christian News 24–7". CBN.com. Retrieved 28 February 2014. ^ Seid, Mike (25 October 2007). "Western Wall was never part of temple". The Jerusalem Post. Retrieved 9 December 2012. ^ "Camp David: An Exchange". The New York Review of Books. 20 September 2001. Archived from the original on 30 September 2009. Retrieved 7 December 2012. ^ a b In the Palestine Liberation Organization's Palestinian Declaration of Independence of 1988, Jerusalem is stated to be the capital of the State of Palestine. In 1997, the Palestinian Legislative Council passed the Palestinian Basic Law (ratified by Chairman Yasser Arafat in 2002), designating the city as such. Article 3: "Jerusalem is the capital of Palestine." See 2003 Amended Basic Law, retrieved 02-06-2013; Arafat Signs Law Making Jerusalem Palestinian Capital, People's Daily, published 6 October 2002; Arafat names Jerusalem as capital, BBC News, published 6 October 2002. ^ Moshe Amirav (2009). Jerusalem Syndrome: The Palestinian-Israeli Battle for the Holy City. Sussex Academic Press. pp. 28–29. ISBN 9781845193478. Retrieved 3 June 2014. ^ "Poll: Jerusalem Arabs prefer Israel". Ynetnews.com. 20 June 1995. Retrieved 7 December 2012. ^ Ben-Gurion, David (5 December 1949). "Statements of the Prime Minister David Ben-Gurion Regarding Moving the Capital of Israel to Jerusalem". The Knesset. Retrieved 2 April 2007. ^ "Jerusalem and Berlin Embassy Relocation Act of 1998". The Library of Congress. Archived from the original on 3 September 2015. Retrieved 12 February 2007. ^ "Basic Law: Jerusalem, Capital of Israel". Israel Ministry of Foreign Affairs. 30 July 1980. Archived from the original on 8 February 2007. Retrieved 2 April 2007. ^ "Resolution 478 (1980)" (PDF). United Nations. 1980. Archived from the original (PDF) on 5 February 2009. Retrieved 30 July 2008. ^ Mosheh ʻAmirav, Jerusalem Syndrome: The Palestinian-Israeli Battle for the Holy City, Sussex University Press, 2009 p. 27: 'In the summer of 2006, these two countries also announced the adoption of a new policy whereby they would no longer recognize Israel's sovereignty in Jerusalem, and transferred their embassies out of the city'. ^ "Embassies and Consulates in Israel". Israel Science and Technology Homepage. Retrieved 5 August 2017. ^ "Guatemala embassy in Israel opens in Jerusalem". Middle East Monitor. 3 May 2018. Retrieved 12 May 2018. ^ "Jerusalem Embassy Act of 1995". U.S. Government Printing Office. 8 November 1995. Retrieved 15 February 2007. ^ "President Donald J. Trump's Proclamation on Jerusalem as the Capital of the State of Israel". White House. 6 December 2017. Archived from the original on 6 December 2017. Retrieved 6 December 2017. ^ "Trump Declares Jerusalem as Israel's Capital". News.com.au. 7 December 2017. Retrieved 7 December 2017. ^ "UN rejects Trump's Jerusalem declaration". 21 December 2017 – via www.bbc.com. ^ Gladstone, Rick (21 December 2017). "Defying Trump, U.N. General Assembly Condemns U.S. Decree on Jerusalem" – via NYTimes.com. ^ Tapsfield, James (18 February 2010). "Israel must co-operate over fake passports, says David Miliband". The Independent. UK. Retrieved 11 September 2010. ^ "Dubai Hamas killing pledge by UK foreign secretary". BBC News. 18 February 2010. Retrieved 11 September 2010. ^ "Editorial A bloody new year in Gaza". Japan Times. 4 January 2009. Retrieved 11 September 2010. ^ Times Online Style Guide – J "Jerusalem must not be used as a metonym or variant for Israel. It is not internationally recognised as the Israeli capital, and its status is one of the central controversies in the Middle East." ^ "Jpost Exclusive: Moscow surprisingly says west Jerusalem is Israel's capital – Israel News – Jerusalem Post". Jpost.com. 6 April 2017. Retrieved 23 September 2017. ^ "Russia could acknowledge West Jerusalem as Israeli Capital". PNN. ^ Foreign Ministry statement regarding Palestinian-Israeli settlement (6 April 2017)"We reaffirm our commitment to the UN-approved principles for a Palestinian-Israeli settlement, which include the status of East Jerusalem as the capital of the future Palestinian state. At the same time, we must state that in this context we view West Jerusalem as the capital of Israel." ^ "English gateway to the Knesset website". Retrieved 18 May 2007. ^ "The State of Israel: The Judicial Authority". Retrieved 18 May 2007. ^ "Jerusalem". PLO-Negotiations Affairs Department (NAD). Archived from the original on 18 April 2016. Retrieved 20 May 2013. ^ "Palestine's Capital: The 1967 border in Jerusalem and Israel's illegal policies on the ground" (PDF). East Jerusalem today. PLO-Negotiations Affairs Department (NAD). August 2013. p. 5. Archived from the original (PDF) on 25 August 2013. Retrieved 5 February 2016. ^ China supports Palestinian UN bid (Xinhua, 8 September 2011) "China recognizes Palestine as a country with east Jerusalem as its capital and possessing full sovereignty and independence, in accordance with borders agreed upon in 1967, according to Jiang"
^ "Resolution 58/292. Status of the Occupied Palestinian Territory, including East Jerusalem". United Nations. 17 May 2004. Archived from the original on 6 August 2012. ^ a b Cidor, Peggy (15 March 2007). "Corridors of Power: A tale of two councils". The Jerusalem Post. Archived from the original on 16 July 2011. Retrieved 28 March 2007. ^ Coker, Margaret (11 November 2006). "Jerusalem Becomes A Battleground Over Gay Rights Vs. Religious Beliefs". Cox Newspapers. Archived from the original on 23 December 2007. Retrieved 28 March 2007. ^ "Safra Square – City Hall". The Municipality of Jerusalem. Archived from the original on 31 October 2002. Retrieved 24 April 2007. ^ a b Bergsohn, Sam (15 May 2006). "Geography". Cornell University. Archived from the original on 14 July 2007. Retrieved 9 February 2007. ^ Walvoord, John; Zachary J. Hayes; Clark H. Pinnock; William Crockett; Stanley N. Gundry (7 January 1996). "The Metaphorical View". Four Views on Hell. Zondervan. p. 58. ISBN 0-310-21268-5. ^ Masterman, E. W. G. (February 1902). "The Water Supply of Jerusalem, Ancient and Modern". The Biblical World. University of Chicago Press. 19 (2): 87–112. JSTOR 3137039. ^ Federman, Josef (18 August 2004). "Debate flares anew over Dead Sea Scrolls". AP via MSNBC. Retrieved 9 February 2007. ^ "Mean Daily Sunshine on each month for Jerusalem, Israel". The Weather Channel. Archived from the original on 14 November 2007. Retrieved 7 February 2007. ^ a b Ma'oz, Moshe; Sari Nusseibeh (March 2000). Jerusalem: Points of Friction-And Beyond. Brill Academic Publishers. pp. 44–6. ISBN 90-411-8843-6. ^ Rory Kess (16 September 2007). "Worst ozone pollution in Beit Shemesh, Gush Etzion". The Jerusalem Post. Archived from the original on 24 June 2011. Retrieved 23 October 2007. ^ "Jerusalem Climate Normals 1961–1990". National Oceanic and Atmospheric Administration. Retrieved 26 April 2017. ^ "Table 3. – Population (1) of Localities Numbering Above 2,000 Residents and Other Rural Population on 31/12/2008" (PDF). Israel Central Bureau of Statistics. Retrieved 26 October 2009. ^ a b c d e f g h i "Press Release: Jerusalem Day" (PDF). Central Bureau of Statistics. 24 May 2006. Retrieved 10 March 2007. ^ "Population and Density per km2 in Localities Numbering Above 5,000 Residents on 31 XII 2005" (PDF). Israel Central Bureau of Statistics. 2006. Archived from the original (PDF) on 5 March 2007. Retrieved 11 April 2007. ^ Reuters (26 September 2000). "Arab population growth outpaces Jews in Jerusalem". CNN. Retrieved 25 July 2018. ^ "Israel approves new East Jerusalem settlement homes". BBC News. Retrieved 12 February 2016. ^ Sela, Neta. "Jerusalem: More tourists, fewer Jews". Ynetnews. Retrieved 10 March 2007. ^ Karl Vick, The Ultra-Holy City, at Time Magazine, 13 August 2012. ^ Hockstader, Lee. "Jewish Drop In Jerusalem Worries Israel". Cornell University. The Washington Post. Archived from the original on 9 September 2006. Retrieved 10 March 2007. ^ "Most Jerusalemites Attend Hareidi-Religious Schools". Arutz Sheva. 21 May 2009. Retrieved 21 March 2019. ^ Shragai, Nadav (20 May 2009). "Most of Jerusalem's non-Jewish children live below poverty line". Haaretz. Retrieved 21 March 2019. ^ Richard Boudreaux. "Clashing values alter a city's face". Los Angeles Times. Retrieved 22 July 2009. ^ Greg Myre (13 May 2007). "Israeli Riddle: Love Jerusalem, Hate Living There". New York Times. Retrieved 22 July 2009. ^ Ken Ellingwood (4 June 2007). "Change cast in concrete". Los Angeles Times. Retrieved 22 July 2009. ^ Peggy Cidor (17 May 2012). "Jerusalem 2012 – the state of things". Jpost.com. Retrieved 7 December 2012. ^ "Jewish Birthrate Up, Arab Rate Down in Jerusalem – Inside Israel – News". Israel National News. 20 May 2012. Retrieved 7 December 2012. ^ Hubbard, Ben. "Holy city twist: Arabs moving into Jewish areas". Cjp.org. Archived from the original on 30 July 2013. Retrieved 7 December 2012. ^ "Jerusalem, Facts and Trends 2009–2010, p. 11" (PDF). Jerusalem Institute for Israel Studies. Retrieved 12 February 2016. ^ "Palestinians grow by a million in decade". The Jerusalem Post/AP. 9 February 2008. Retrieved 18 October 2010. ^ Medzini, Ronen (5 October 2010). "Jerusalem: Only 21% of Jews secular". Ynetnews. Retrieved 21 March 2019. ^ Meir, Noam. (27 October 2016) "New Jerusalem Gateway Business District Project Begins Development". Jewish Business News website Retrieved 12 February 2017. ^ Eisenbud, Daniel K. (12 February 2017). "Young, secular exodus spurring Jerusalem population loss". The Jerusalem Post. Retrieved 12 February 2017. ^ Rapoport, Meron (20 January 2005). "Land lords". Haaretz. Archived from the original on 20 December 2008. ^ Guinn, David E. (2 October 2006). Protecting Jerusalem's Holy Sites: A Strategy for Negotiating a Sacred Peace (1st ed.). Cambridge University Press. p. 142. ISBN 0-521-86662-6. ^ "Parshat Re'eh: No Jerusalem in Torah – Israel Opinion, Ynetnews". Ynetnews.com. 20 June 1995. Retrieved 17 October 2011. ^ "What is the Western Wall?". The Kotel. Archived from the original on 2 February 2007. Retrieved 6 March 2007. ^ Goldberg, Monique Susskind. "Synagogues". Ask the Rabbi. Schechter Institute of Jewish Studies. Archived from the original on 31 January 2008. Retrieved 10 March 2007. ^ a b Segal, Benjamin J. (1987). Returning: The Land of Israel as Focus in Jewish History. Jerusalem, Israel: Department of Education and Culture of the World Zionist Organization. p. 124. Archived from the original on 23 December 2005. Retrieved 10 March 2007. ^ Boas, Adrian J. (12 October 2001). "Physical Remains of Crusader Jerusalem". Jerusalem in the Time of the Crusades. Routledge. p. 112. ISBN 0-415-23000-4. The interesting, if not reliable illustrations of the church on the round maps of Jerusalem show two distinct buildings on Mount Zion: the church of St Mary and the Cenacle (Chapel of the Last Supper) appear as separate buildings. ^ Endo, Shusaku (1999). Richard A. Schuchert (ed.). A Life of Jesus. Paulist Press. p. 116. ISBN 0-8091-2319-3. ^ a b Stump, Keith W. (1993). "Where Was Golgotha?". Worldwide Church of God. Archived from the original on 2 April 2007. Retrieved 11 March 2007. ^ Ray, Stephen K. (October 2002). St. John's Gospel: A Bible Study Guide and Commentary for Individuals and Groups. San Francisco, CA: Ignatius Press. p. 340. ISBN 0-89870-821-4. ^ O'Reilly, Sean; James O'Reilly (30 November 2000). PilgrFile: Adventures of the Spirit (1st ed.). Travelers' Tales. p. 14. ISBN 1-885211-56-2. The general consensus is that the Church of the Holy Sepulchre marks the hill called Golgotha, and that the site of the Crucifixion and the last five Stations of the Cross are located under its large black domes. ^ Cordesman, Anthony H. (30 October 2005). "The Final Settlement Issues: Asymmetric Values & Asymmetric Warfare". The Israeli-Palestinian War: Escalating to Nowhere. Praeger Security International. p. 62. ISBN 0-275-98758-2. ^ Peters, Francis E. (20 October 2003). "Muhammad the Prophet of God". The Monotheists: The Peoples of God. Princeton University Press. pp. 95–6. ISBN 0-691-11460-9. ^ "Merits of the Helpers in Madinah (Ansaar) – Hadith Sahih Bukhari". Haditsbukharionline.blogspot.ca. Retrieved 7 December 2012. ^ "Me'raj – The Night Ascension". Al-islam.org. Retrieved 7 December 2012. ^ a b c Dumper, Michael (15 April 1996). The Politics of Jerusalem Since 1967. Columbia University Press. pp. 207–10. ISBN 0-231-10640-8. ^ "World's Best Awards 2010 – Africa and the Middle East". Archived from the original on 12 July 2010. Retrieved 11 July 2010. ^ Gil Zohar (28 June 2007). "Bet your bottom dollar?". The Jerusalem Post. Archived from the original on 24 June 2011. Retrieved 10 July 2007. ^ "Har Hotzvim Industrial Park". Har Hotzvim Industrial Park. Archived from the original on 27 April 2007. Retrieved 13 March 2007. ^ "Employed Persons, by Industry, District and Sub-District of Residence, 2005" (PDF). Israeli Central Bureau of Statistics. Archived from the original (PDF) on 14 June 2007. Retrieved 11 April 2007. ^ Hasson, Nir (20 May 2012). "Report: 78% of East Jerusalem Palestinians live in poverty". Haaretz. Retrieved 23 May 2012. ^ "Jerusalem's tallest buildings – Top 20 | Statistics". Emporis. Retrieved 7 December 2012. ^ "Holyland Tower 2 | Buildings". Jerusalem /: Emporis. Retrieved 7 December 2012. ^ Hasson, Nir (2 April 2008). "Jerusalem skyline to undergo massive transformation with 12 new skyscrapers Israel News | Haaretz Daily Newspaper". Haaretz.com. Retrieved 7 December 2012. ^ Dvir, Noam (7 March 2011). "Jerusalem reaches for the heavens – Israel News | Haaretz Daily Newspaper". Haaretz.com. Retrieved 7 December 2012. ^ Lidman, Melanie (14 August 2012). "Interior Ministry approves 12 skyscrapers for J'lem". Jpost.com. Retrieved 7 December 2012. ^ "A revitalized downtown Jerusalem – with skyscrapers". Israelity. 7 March 2011. Archived from the original on 12 May 2012. Retrieved 7 December 2012. ^ "Migdal Merkaz HaYekum | Buildings". Jerusalem /: Emporis. Retrieved 12 March 2013. ^ "The "Pyramid" Will Be the Newest Addition to Jerusalem's Skyline". 3 August 2015 – via Slate. ^ Solomon, Shoshanna (1 November 2001). "Facets of the Israeli Economy – Transportation". Israel Ministry of Foreign Affairs. Retrieved 14 March 2007. ^ Afra, Orit (8 February 2007). "Panacea or pain?". The Jerusalem Post. Archived from the original on 7 June 2009. Retrieved 17 March 2007. ^ "Life in Jerusalem – Transportation". Rothberg International Station – Hebrew University of Jerusalem. Archived from the original on 12 September 2007. Retrieved 14 March 2007. ^ "Jerusalem – Malha". Israel Railways. Archived from the original on 6 October 2007. Retrieved 14 March 2007. ^ "Passenger Lines Map". Israel Railways. Archived from the original on 6 October 2007. Retrieved 14 March 2007. ^ a b Burstein, Nathan (19 January 2006). "Running rings around us". The Jerusalem Post. Archived from the original on 24 June 2011. Retrieved 17 March 2007. ^ Gil Zohar. "Their way or the highway?". The Jerusalem Post. Archived from the original on 24 June 2011. Retrieved 11 June 2007. ^ "Times Higher Education". Times Higher Education. 9 October 2008. Archived from the original on 14 April 2011. Retrieved 5 May 2009. ^ Hershko, Avram. "Avram Hershko". The Nobel Foundation. Retrieved 18 March 2007. ^ Gross, David. "David J. Gross". The Nobel Foundation. Retrieved 18 March 2007. ^ Kahneman, Daniel. "Daniel Kahneman". The Nobel Foundation. Retrieved 18 March 2007. ^ "About the Library: Main Collections". Jewish National and University Library. Archived from the original on 29 April 2007. Retrieved 27 March 2007. ^ "About the Library: History and Aims". Jewish National and University Library. Archived from the original on 21 April 2007. Retrieved 27 March 2007. ^ a b "Science & Technology". al-Quds University. Archived from the original on 28 September 2007. Retrieved 19 March 2007. ^ "Urgent Appeal". al-Quds University. Archived from the original on 17 March 2007. Retrieved 27 March 2007. ^ "Official site". Jerusalem Academy of Music and Dance. Archived from the original on 4 May 2010. Retrieved 24 July 2018. ^ "Official site". Bezalel Academy of Art and Design (in Hebrew). Archived from the original on 12 May 2016. Retrieved 24 July 2018. ^ "Welcome to the Bezalel Academy of Art and Design Jerusalem". Archived from the original on 22 October 2007. Retrieved 24 July 2018. ^ "About JCT". 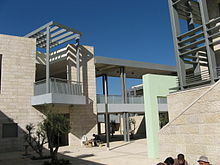 Jerusalem College of Technology. Archived from the original on 1 February 2008. Retrieved 25 March 2007. ^ Wohlgelernter, Elli (28 December 2000). "The village of Mir, where Torah once flowed". Jewish Agency for Israel. Archived from the original on 2 February 2008. Retrieved 26 March 2007. ^ Jonathan Lis (4 May 2005). "The best medicine for Jerusalem". Retrieved 22 July 2009. ^ a b "Summary". Second Class Discrimination Against Palestinian Arab Children in Israel's Schools. Human Rights Watch. September 2001. Retrieved 27 March 2007. ^ Lefkovits, Etgar (10 September 2008). "Bridging the gap". The Jerusalem Post. Archived from the original on 16 September 2011. Retrieved 24 July 2018. ^ a b Lis, Jonathan (21 April 2008). "Mayor to raise funds for E. J'lem Arabs to block Hamas". Haaretz. Retrieved 9 September 2011. ^ Or Kashti (18 March 2007). "8,000 new classrooms to be built in Arab, ultra-Orthodox schools". Archived from the original on 7 June 2008. Retrieved 22 July 2009. ^ a b "About the Museum". The Israel Museum, Jerusalem. Archived from the original on 6 February 2007. Retrieved 27 February 2007. ^ "Shrine of the Book". The Israel Museum, Jerusalem. Archived from the original on 28 February 2007. Retrieved 27 February 2007. ^ "Ticho House". The Israel Museum, Jerusalem. Archived from the original on 5 February 2007. Retrieved 28 February 2007. ^ "The Rockefeller Archaeological Museum". The Israel Museum, Jerusalem. Archived from the original on 4 March 2007. Retrieved 28 February 2007. ^ "The Rockefeller Archaeological Museum: About the Museum: The Permanent Exhibition". The Israel Museum, Jerusalem. Archived from the original on 11 December 2007. Retrieved 28 February 2007. ^ Rosenblum, Irit. "Haareez Biblical Zoo favorite tourist site in 2006". Haaretz. Israel. Retrieved 11 September 2010. ^ Lis, Jonathan. "Jerusalem Zoo is Israel's number one tourist attraction". Haaretz. Israel. Retrieved 9 September 2011. ^ "Yad Vashem". The Holocaust Martyrs' and Heroes' Remembrance Authority. Retrieved 28 February 2007. ^ "About Yad Vashem". The Holocaust Martyrs' and Heroes' Remembrance Authority. Archived from the original on 17 February 2007. Retrieved 28 February 2007. ^ a b "History". Jerusalem Orchestra. Archived from the original on 28 September 2007. Retrieved 4 March 2007. ^ "Jerusalem Music Center". Archived from the original on 17 March 2007. Retrieved 18 May 2007. ^ "The Jerusalem Centre for the Performing Arts". Jerusalem Theater. Archived from the original on 2 February 2007. Retrieved 4 March 2007. ^ "About Us". The Khan Theatre. 2004. Archived from the original on 11 August 2010. Retrieved 9 September 2011. ^ "Summer Nights Festival 2008". Jerusalem Foundation. Archived from the original on 20 December 2008. Retrieved 20 July 2008. ^ "About The Festival". Jerusalem Film Festival. Retrieved 20 July 2008. ^ a b "Israel bans Palestinian cultural events – Israel News, Ynetnews". Ynetnews.com. 20 June 1995. Retrieved 22 January 2010. ^ "History". Palestinian National Theatre. Archived from the original on 29 September 2007. Retrieved 4 March 2007. ^ "Palestine Youth Orchestra". Ncm.birzeit.edu. Archived from the original on 27 September 2011. Retrieved 17 October 2011. ^ "List of Palestinian Cultural & Archeological Sites". Jerusalem Media & Communication Centre. Archived from the original on 25 January 2008. Retrieved 20 July 2008. ^ "About Alhoash". Palestinian ART Court. Archived from the original on 3 July 2008. Retrieved 20 July 2008. ^ "Promoting Palestinian culture presents challenge to occupation and celebrates heritage". Alquds2009.org. Archived from the original on 21 July 2011. Retrieved 11 September 2010. ^ "The Museum". Museum On The Seam. Archived from the original on 29 April 2009. Retrieved 9 September 2011. ^ "Jerusalem Center for Middle Eastern Music and Dance". Jerusalemfoundation.org. Archived from the original on 1 October 2011. Retrieved 17 October 2011. ^ ""Speaking Art" Conference: Jewish-Arab Dialogue Through the Arts at the Jerusalem Intercultural Center". Jicc.org.il. Archived from the original on 5 November 2011. Retrieved 17 October 2011. ^ "The Jewish-Arab Youth Orchestra". Jerusalemfoundation.org. Archived from the original on 26 July 2011. Retrieved 11 September 2010. ^ Kershner, Isabel (17 October 2008). "Symbol of Peace Stands at Divide Between Troubled Jerusalem's East and West". New York Times. Retrieved 18 October 2008. ^ Torstrick, Rebecca L. (30 June 2004). Culture and Customs of Israel. Greenwood Press. p. 141. ISBN 0-313-32091-8. The two most popular spectator sports in Israel are football and basketball. ^ Griver, Simon (October 1997). "Betar Jerusalem: A Local Sports Legend Exports Talent to Europe's Top Leagues". Israel Magazine via the Israel Ministry of Foreign Affairs. Archived from the original on 2 April 2013. Retrieved 7 March 2007. ^ "בית"ר ירושלים האתר הרשמי – דף הבית". Bjerusalem.co.il. Archived from the original on 23 August 2007. Retrieved 11 September 2010. ^ Eldar, Yishai (1 December 2001). "Jerusalem: Architecture Since 1948". Israeli Ministry of Foreign Affairs. Retrieved 7 March 2007. ^ "Palestinian Football Association, Jabal Al-Mokaber". Pfa.ps. Archived from the original on 2 May 2011. Retrieved 17 October 2011. ^ Baskin, Rebecca (20 January 2010). "First Jerusalem marathon to be held in 2011". The Jerusalem Post. Retrieved 2 February 2013. ^ Davidovich, Joshua (16 March 2012). "Kenyan slogs out Jerusalem marathon win through soggy weather". The Times of Israel. AP. Retrieved 2 February 2013. ^ Ward, Harold (16 March 2012). "Thousands brave rain, wind for Jerusalem marathon". AFP. Archived from the original on 5 March 2014. Retrieved 2 February 2013. ^ Pazornik, Amanda (27 January 2011). "Jerusalem hills won't faze local marathon runners". Jweekly. Retrieved 2 February 2013. ^ "Interactive course map". Municipality of Jerusalem. Archived from the original on 27 April 2007. Retrieved 2 February 2013. ^ "International Exchange: List of Sister Cities / Kyoto prefecture Multilingual Site". Pref.kyoto.jp. Retrieved 18 September 2013. ^ "Online Directory: Israel, Middle East". Sister Cities International. Archived from the original on 17 January 2008. Retrieved 5 April 2007.